Chesterfield County (S.C.) authorities are seeking the public’s help in locating a murder suspect wanted in connection with a Sunday night shooting in Cheraw. Demonta Deone Gillespie was last seen driving a 2012 white Chevy Impala with South Carolina tags JWD 833. 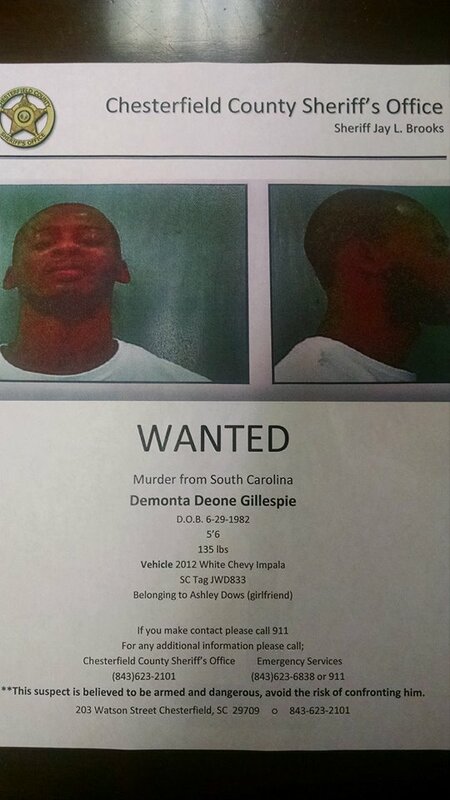 Gillespie is accused of shooting 28-year-old Brandon Ellerbe, of Cheraw. Ellerbe died Sunday night of injuries sustained in the shooting. Brooks described the events leading up to the shooting as an between “two friends” inside a home on Fordville Road, just south of the town of Cheraw. “It was over nothing,” Brooks lamented. Brooks said at one point, the two were asked to take the argument outside. Next thing witnesses report is hearing at least one gunshot. Brooks said investigators recovered shell casings from the scene but declined to reveal what type of weapon was used. If you see the described vehicle or have information that could help authorities locate Gillespie, call the Chesterfield County Sheriff’s Office at 843-623-2101 or 843-623-6838, or call 911. © 6082 The Pee Dee Post. All rights reserved. XHTML / CSS Valid.